Our plum trees are on strike. The three large trees on the boundary have given up on summer and have refused to produce a single plum. The smaller tree by the gate has obliged with a plateful. This year it looks like it will be one small pie instead of several kilos of jam. Humph! Another downside of the saturated summer we have been treated to. Yesterday, I was able to enquire after the health of the Post Office Pig. It transpired that Sir Hinu Porker had had a bad case of lice. The postmistress was very concerned and so enquired how much the treatment would cost for such a corpulent pig at the vets. Several hundred dollars for the fluid to rub down the lad and rid him of the pestilence by Jove! Our enterprising postmistress then phoned up a few local pig farmers. They recommended that a few gallons of drained engine oil smeared over the lad would do just as well - a kind of suffocating marinade. So, Sir Hinu was rubbed clean of his lice with a beautifying smear of truck oil, and all is now well. Use number 305 for Castrol GTX! 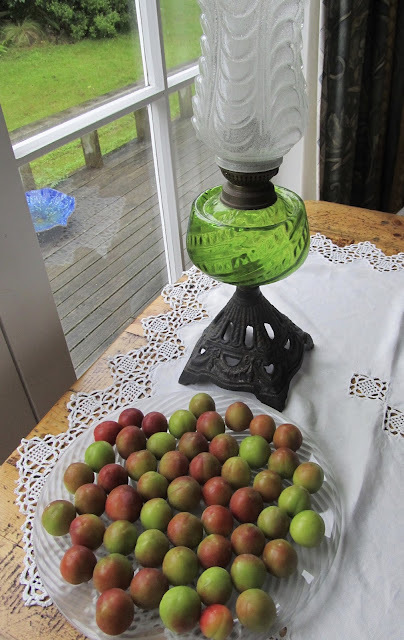 Well, the plums you *did* get look lovely... enjoy!